I actually think they are wildly useful. And have formed the basis of many key relationships for both myself and many of my close colleagues. And you should never leave home without them. Think about it: when you first meet someone, 99% of that interaction is going to be words spoken between you, your ability to engage with that person, and the common interests, products, needs, or skills which you are able to discuss. I am not going to debate that. And, whether or not you choose to follow up with someone is definitely up to you and will likely be influenced by the mutual perceived value of that interaction and your ability to help each other later on down the line. But I cannot tell you how many times I have met someone, really enjoyed their presence, and then totally forgotten their name or moved on to something else requiring more focus 5 minutes later. Hence, no ability to add them on Linked In, shoot them a follow up note, or do deeper research into their role, company, or industry. And, you know what? Shame on me for that. But the bigger “shame on me” in my opinion is not at least giving them my business card. I have zero excuse. I should have them on me at all times. Because even if they don’t carry theirs with them – I should be confident that my interaction with them was engaging enough that, when they go to clean out their pockets that day (or later that week, the next month when they finally do dry-cleaning, whatever – I don’t judge! ), odds are that seeing my business card will make them recall that interaction. And, in the event that I am able to get one of theirs in return – I am going to do the exact same thing. I may not follow up immediately, maybe not even in the next month. But when I stumble upon that business card later or add that person to a professional network/contact list of mine, I have provided some form of cement, something tangible, to that relationship which may not have been there without the trusty business card. Listen, I know they aren’t for everyone and some people are anti-business cards. I get that. But for those of the rest of us that still need some traditional crutches or subtle reminders over time to connect with someone, look someone up, or add someone to our professional records – they are a fantastic way to ensure there is something physical to back up a relationship besides the memory of a great chat. I am a huge advocate and invite you to reassess whether or not it may be time for you to issue your next order for a fresh set. 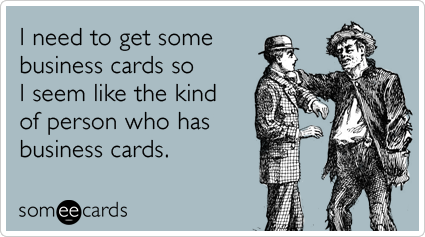 Editor’s note: Sorry for all the continued someecards images alongside the articles. To be honest, I was really just aiming to get some color behind the blog. And – I’ll admit – I think they are generally wildly entertaining and provide witty commentary on issues facing us all.